Harvard University Press, 9780674725119, 279pp. From workers' wages to presidential elections, labor unions once exerted tremendous clout in American life. In the immediate post-World War II era, one in three workers belonged to a union. The fraction now is close to one in ten, and just one in twenty in the private sector--the lowest in a century. The only thing big about Big Labor today is the scope of its problems. While many studies have attempted to explain the causes of this decline, What Unions No Longer Do lays bare the broad repercussions of labor's collapse for the American economy and polity. Organized labor was not just a minor player during the "golden age" of welfare capitalism in the middle decades of the twentieth century, Jake Rosenfeld asserts. Rather, for generations it was the core institution fighting for economic and political equality in the United States. Unions leveraged their bargaining power to deliver tangible benefits to workers while shaping cultural understandings of fairness in the workplace. The labor movement helped sustain an unprecedented period of prosperity among America's expanding, increasingly multiethnic middle class. 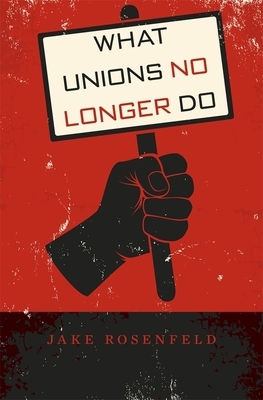 What Unions No Longer Do shows in detail the consequences of labor's decline: curtailed advocacy for better working conditions, weakened support for immigrants' economic assimilation, and ineffectiveness in addressing wage stagnation among African Americans. In short, unions are no longer instrumental in combating inequality in our economy and our politics, and the result is a sharp decline in the prospects of American workers and their families.